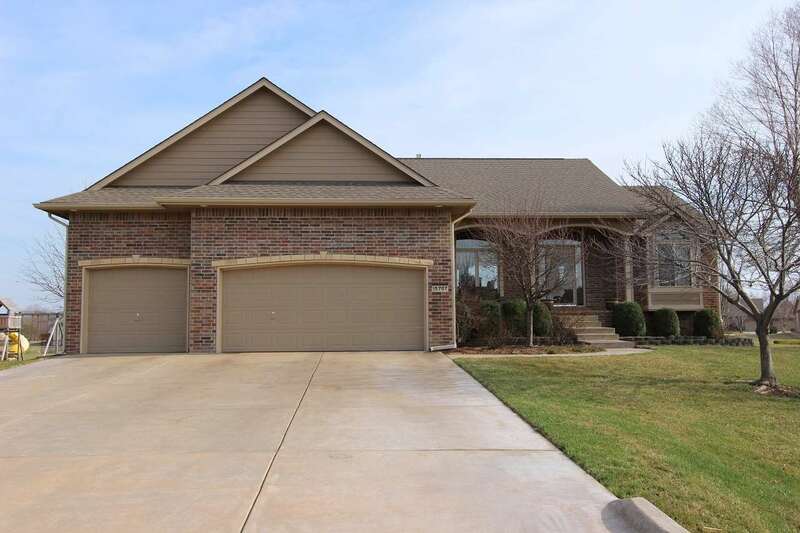 This beautiful ranch-style home backs up to a peaceful community pond in Reece Farms Estates. The main level offers a split floor plan with neutral paint, carpet, and hardwood flooring. The master suite has an en suite bathroom with double sinks, a separate tub and shower, and a walk-in closet while the large bedroom has an exterior door that exits onto a private covered deck overlooking the backyard and pond. The kitchen has an eating bar and breakfast noon and the pantry is across the hall. The laundry room is beside the pantry and exits to an over-sized 3-car garage. There are two bedrooms and a full bathroom located near the entryway, living room, and formal dining. The view out basement has a family/rec room with a pellet stove that will keep the basement warm in the cool months, a wet bar, two bedrooms, a full bathroom, storage room, and has a mid-level exit door to the backyard patio. Schedule your showing appointment today to tour this lovely home.